Update, April 16: Codename: Savage is back for another round of testing in PlayerUnknown’s Battlegrounds, this time with a new batch of locations to spice things up. Codename: Savage is the upcoming third map for PUBG, and we’ve already had a crack at it thanks to some very early bouts on the experimental test server. 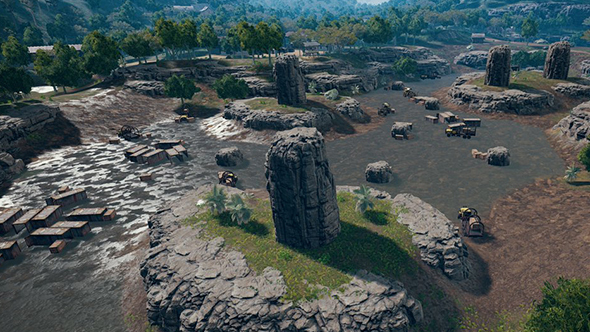 Here’s your friendly reminder that round two begins tonight, and PUBG Corp have shared the first look at a handful of new locations getting added to Savage tonight. Codename: Savage returns today. You’ll notice some updates have been made to the map since the first round of testing. Check out the three new locations. Round two of Savage testing begins at 18:00 PDT / 21:00 EDT / 01:00 GMT, and will last for 48 hours. If got a key for the test last time, it’ll still be good here, but more keys are available on the official site. You’ll be good to sign up until tomorrow. Original story, April 12:Testing for PlayerUnknown’s Battlegrounds’ third map, currently codenamed Savage, is due to return. An announcement onSteamconfirmed that the Closed Experimental Server would reopen this coming Monday, April 16. Savage first became available for testing earlier this month, and was live for around four days. Players could access it through keys distributed by PUBG Corp, through a signup website. That system will return for the second round of testing, with signups opening on Saturday April 14 at 05:00 PDT (13:00 BST) and closing on April 17. If you got access to the first test, you won’t have to sign up again. This time, Savage will run for two days, beginning on April 16 at 18:00 PDT and coming to an end on Wednesday, April 18 at the same time. The 4x4km Savage map is a quarter of the size of the game’s other two maps, European map Erangel and desert-themed Miramar. That means the action is condensed, in an attempt to alleviate some of the pacing problems around PUBG’s mid-game. PUBG Corp say there will be further testing in the coming weeks, with a full schedule due to be published on Monday.